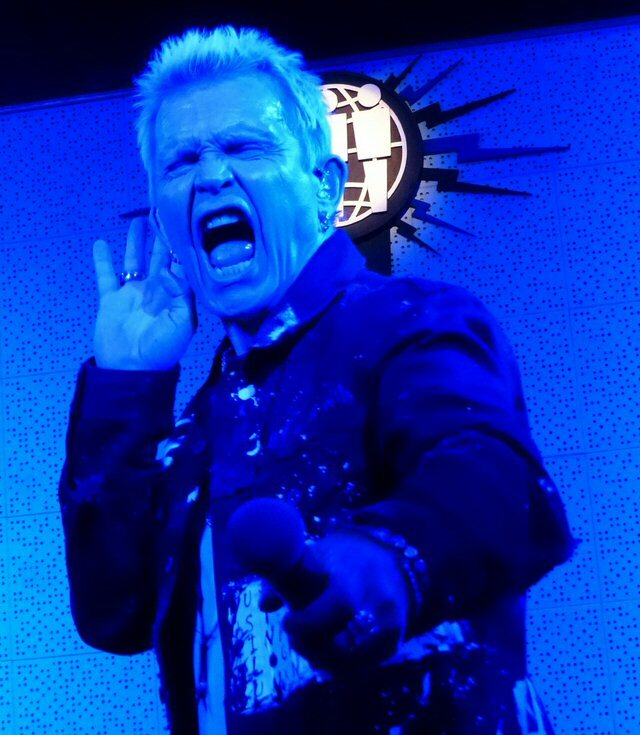 Like a call in the midnight hour the last minute invitation to see a special performance at Jack White's place in Nashville featuring 80' rock legend Billy Idol had us practicing our rebel yell in advance of this historic afternoon performance on Friday, September 28, 2018. Billy Idol was revitalized in Nashville. So, we anxiously followed the whites stripes on the "Blue Highway" to the confines of The Blue Room at Third Man Records - the one part studio, one part record store, one part event space, one part label and presumably much more - to watch Billy Idol and Steve Stevens do a 2 PM warm-up set for their concert scheduled later in the evening at the much larger Carl Black Chevy Woods Amphitheater at Fontanel Mansion in nearby Whites Creek. Early into the five song showcase one adoring female fan screamed out "you still got it, Billy" and indeed he very much does. Like a poster child for turning 62 the iconic Idol was fit and energetic as he delivered many of the tracks that powered him and his own brand of new wave punk anthems to the top of the charts in the early 80's and 90's. Together with his long time associate and songwriting partner on guitar the pair ran through five acoustic yet rockin' takes on several crowd pleasers. Seemingly in storyteller mode Idol mentioned being influenced by his sister's nuptials as inspiration for "White Wedding". He then relayed that the impetus behind "Kiss Me Deadly" was an attempt to create their own "Jungleland" style song. The acoustic and intimate setting seemed to suit the two rockers just fine as numerous smiles and high-fives were shared by them in between numbers. 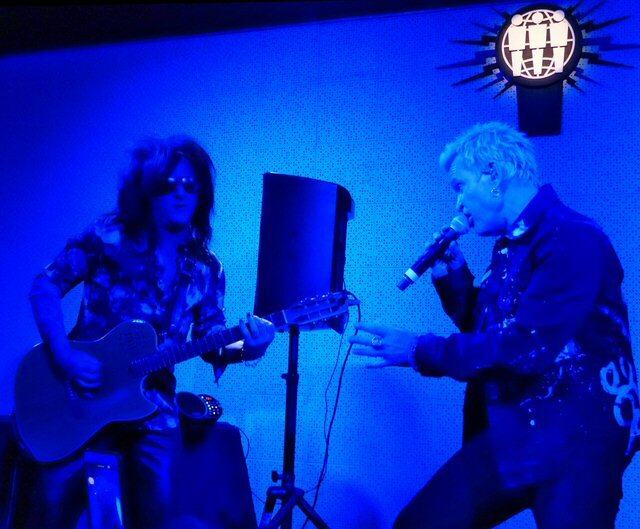 Billy Idol and Steve Stevens go way back and they dug deep into their past at TMR. Punk/glam/hard rock icon Billy Idol made history decades ago with the 1985 release of his remix album, Vital Idol. Years before dance-floor primed remixes were widely in vogue, Idol helped cement the vibrancy of the genre in the late '80s, all the while continuing to release his own seminal original work, and has remained a vibrant and iconic figure in rock in the years since. 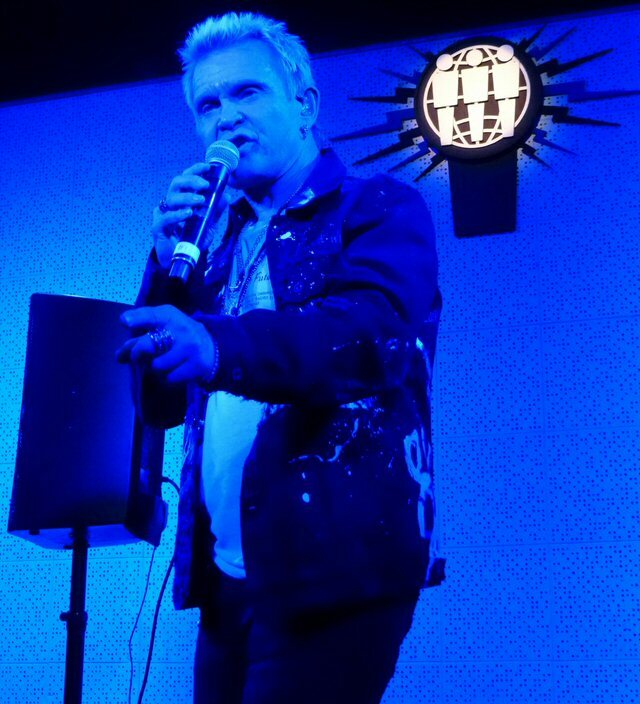 With this special midday performance arranged to mark the brand new release of a spiritual follow-up, Vital Idol: Revitalized, Billy was the opposite of idle in Nashville. The record reimagines his most essential hits with the help of modern dance and remix producers. Not a reissue of the original LP, but a new effort thorough a 21st century lens, the effort continues a prolific comeback, which began with 2014's Kings & Queens of the Underground and a best-selling autobiography. Idol returned to Nashville for the first time since 2015 (which was his first Music City stop in nearly three decades), for not one, but two local appearances in the same day. 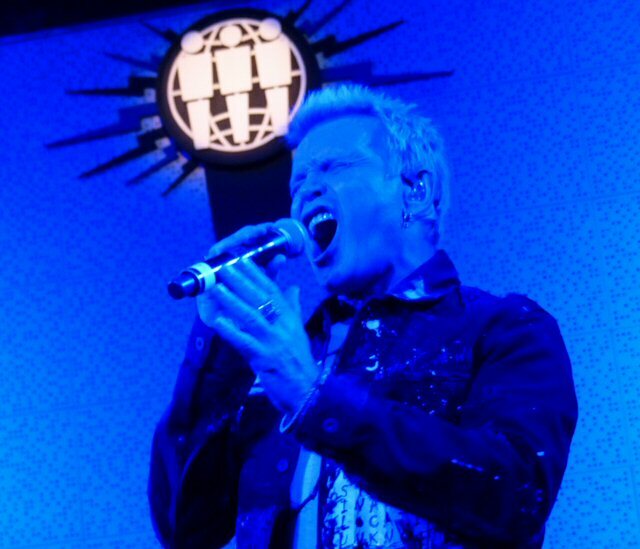 With a "Rebel Yell" fans cried more, more, more in Music City. The room was small with capacity capped at 150 that allowed guests to freely move between their spot in the venue and the complimentary bar that was set-up to serve refreshments. A variety of cocktails and beverages generously supplied by Pennington Distilling Co., Constellation Brands and Yee-Haw Brewing helped get the party started early at the beginning of this memorable Mid-Tenn weekend. Before Billy took the stage fans were treated to a DJ set by RAC - the artist whose expert remixing hands just happen to be all over Idol's new record. He would also be opening the concert later in the evening north of the city at the one time home of country star Barbara Mandrell. The mesmerizing background music set the pace for nearly 45 minutes and between the alcohol and steady beats the trance like state was in place for the appearance of the revered and idolized rocker. Third Man Records is an independent record label founded by musician and recording artist Jack White in Detroit, Michigan, in 2001. Third Man established its first physical location - a combination record store, performance venue, and headquarters for the label - in Nashville, Tennessee, in 2009. The label opened a Detroit branch location in 2015, which added a pressing plant (Third Man Pressing) in 2017. TMR has since become a favorite spot for tourists while emerging as a valuable and treasured member of the Music City music community. On display were all the ingredients that make Billy Idol the rock idol and icon that he is.